Strange how there seem to be so many studio posed photos featuring Coventry Eagles. 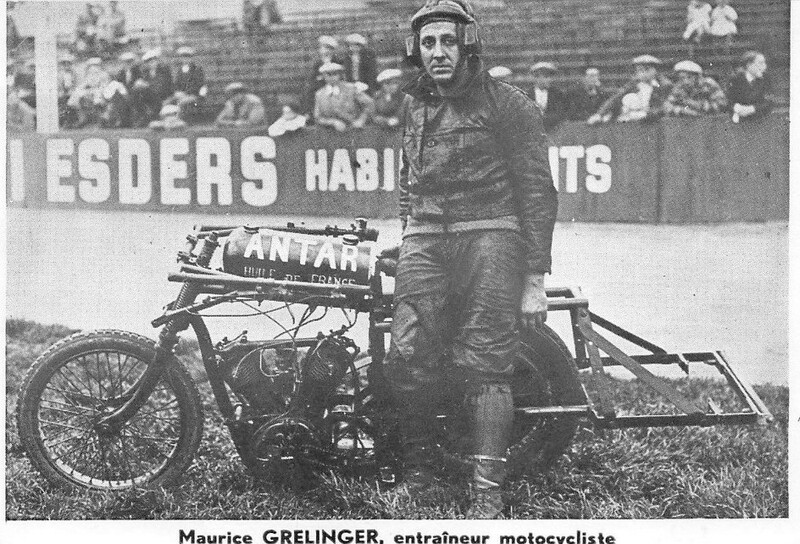 Maybe it was some kind of sponsorship deal. 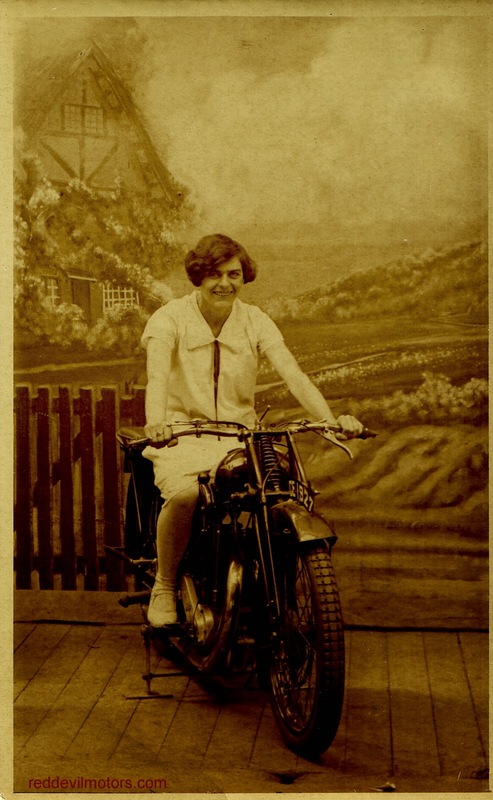 This particular bike bears the reg number CE 1927, from the same studio a photo has featured on the blog before with the reg CE 1930. 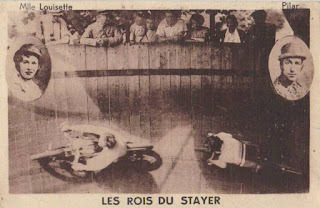 There's really not much out there has been written on the subject of stayers. 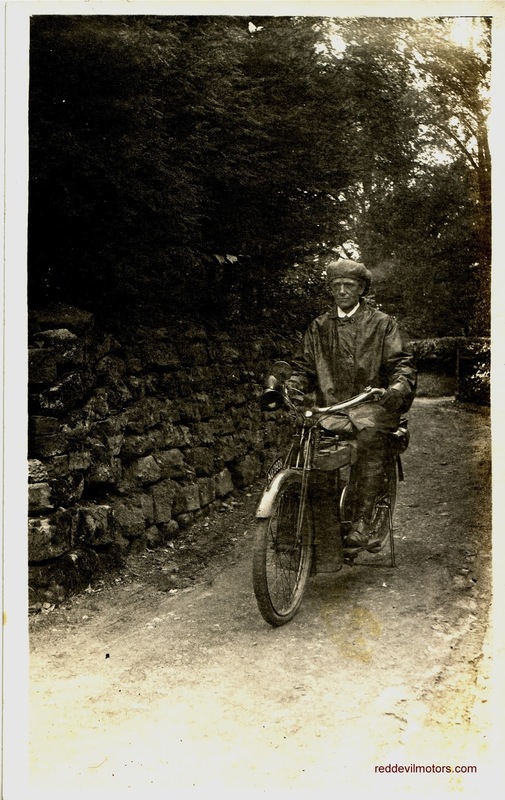 Sadly I'm not about to enlighten all with an exhaustive history of bicycle pacers as I just don't know enough myself yet but there's knowledge can be gained from looking at old images so I've gathered together a selection broader than you are likely to find elsewhere on the web. 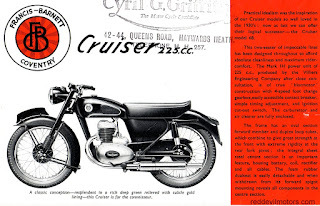 Personally I find bicycle pacers fascinating, both the bicycle and motorcycle are specialised machines built for just the one task. 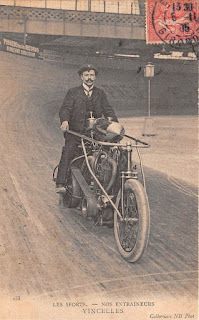 The early motorcycle pacers are incredible behemoths, huge engines and singular of purpose in their pursuit of speed. 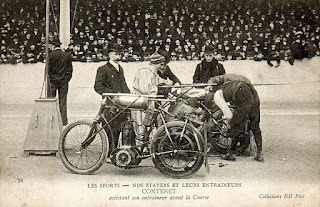 In the very earliest days of pacing cars were used for the long distance races such as the Paris-Roubaix and Bordeaux-Paris. The Bordeaux-Paris was paced by cars from 1897 to 1899 but the dust and exhaust fumes were infernal and the danger posed to the cyclists great. 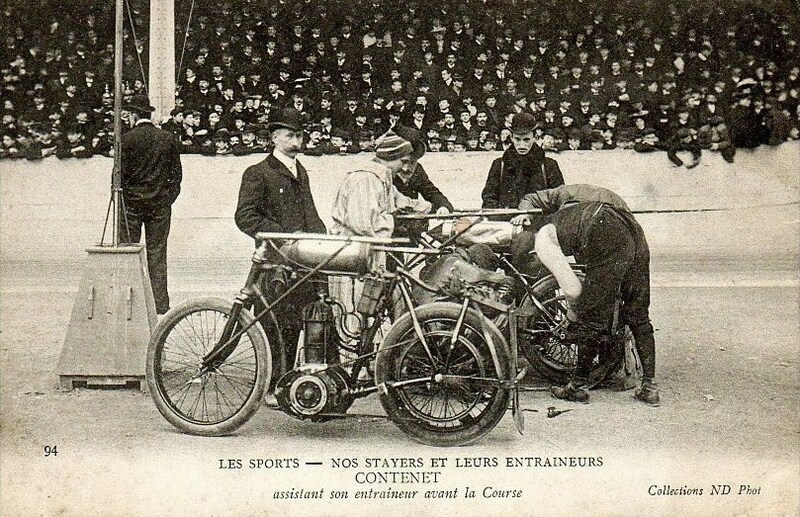 As velodromes became popular so did the motorcycle pacers. 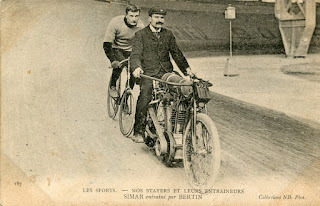 Early paced races were limited in speed by the motorcycles themselves rather than the cyclists but speeds rose quickly and by 1904 100kmh could be expected. 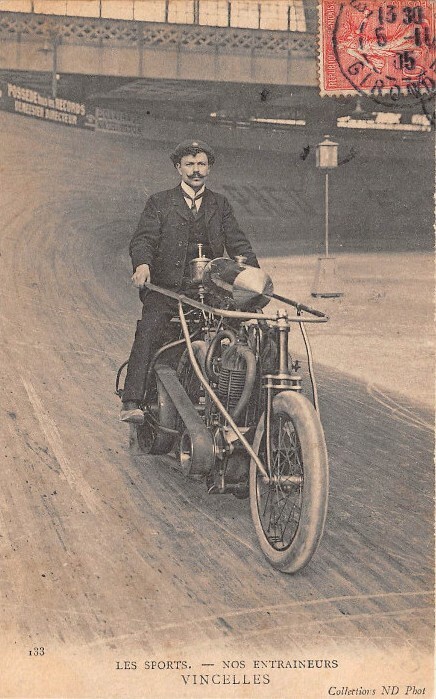 As the speeds increased so did accidents, many of which were gruesome in nature. 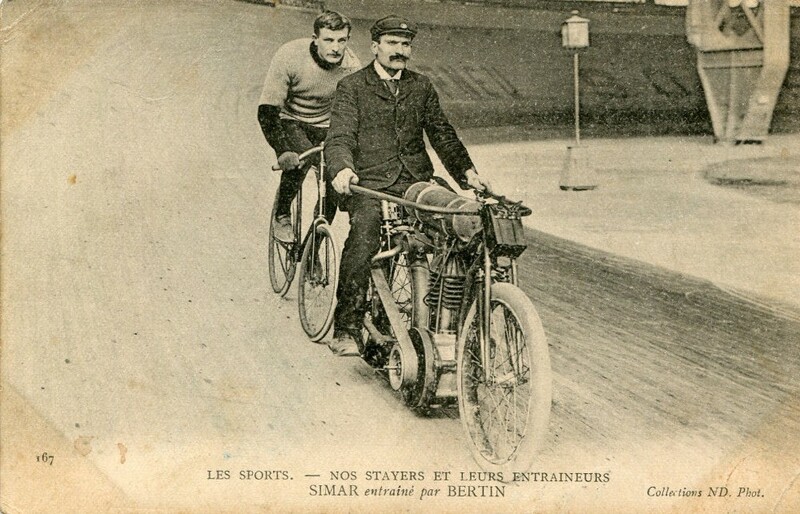 Bicycle tyres were flimsy, barely suitable for purpose and a blow out at 100kmh riding in close quarters to other bicycles and pacers could be disasterous. Though the bulk of injuries and deaths were born by the cyclists it was not unknown for the stayer pilots or indeed spectators to be the victims. There is a fascinating history of bicycle pacing waiting to be uncovered, a look through these images reveals that the stayer pilots were every bit the celebrity the cyclists were and the spectacle of stub-piped monster-engined motorcycles with their bicycle familiars circulating at huge speeds in close formation must have been mind-blowing at the time. 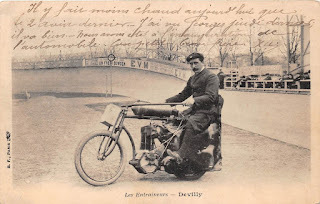 it dates from the 1900s. 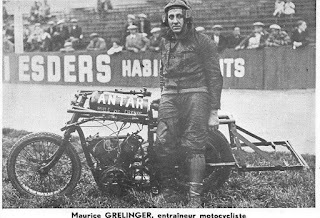 Dated 1905. This machine is a beast! as close as possible for maximum speed boost. 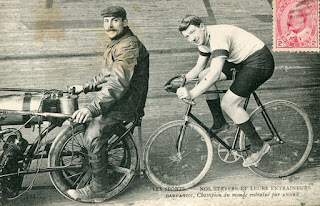 A pair of cycle pacers from the pre-WWI era. 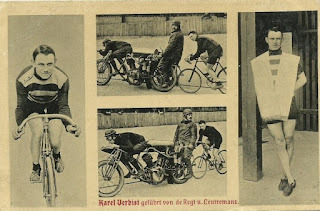 An 'action' photograph. 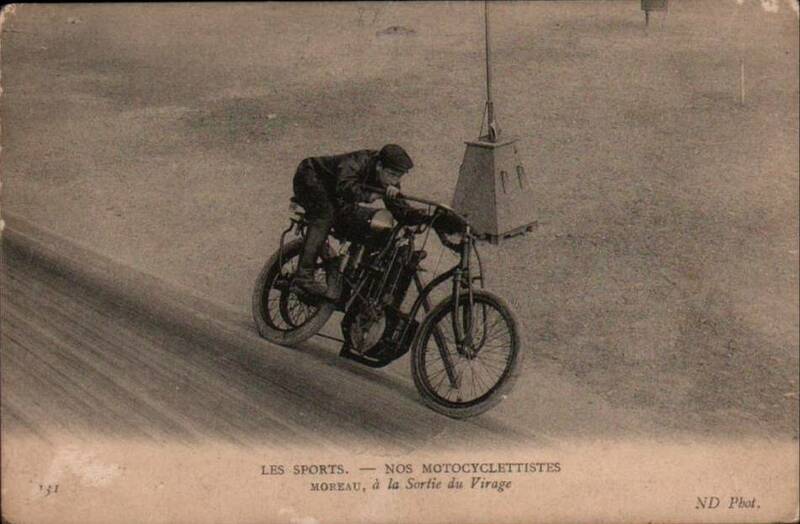 Note the pole propping the rider up! 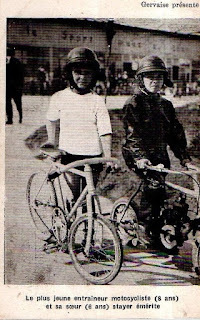 year old girl is the cyclist. From Germany. The stayer is an absolute monster. This particular image carries a Canadian stamp. This German image could well be post WWII. 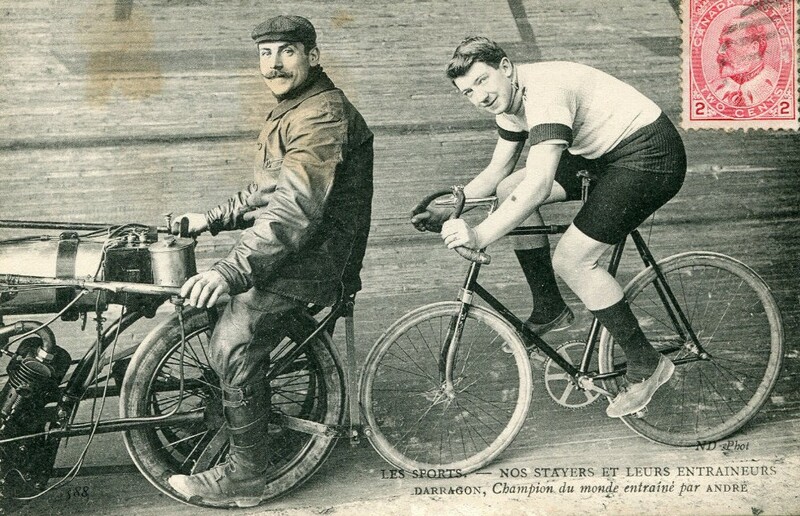 Another stayer and cyclist pairing. Finally another novelty card. 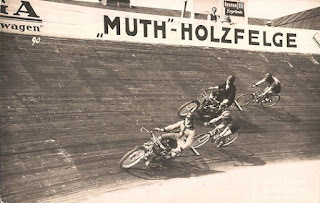 Pacing on the wall of death. This isn't a quality photo by any stretch of the imagination but I like these images of regular folks and their bikes. The everyman's camera wasn't a precision instrument back then and in the pre-digital age you had to take a picture and then hope it came out well. 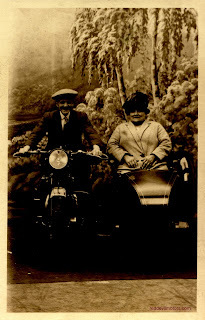 If it didn't you probably kept the photo anyway as it had cost you. 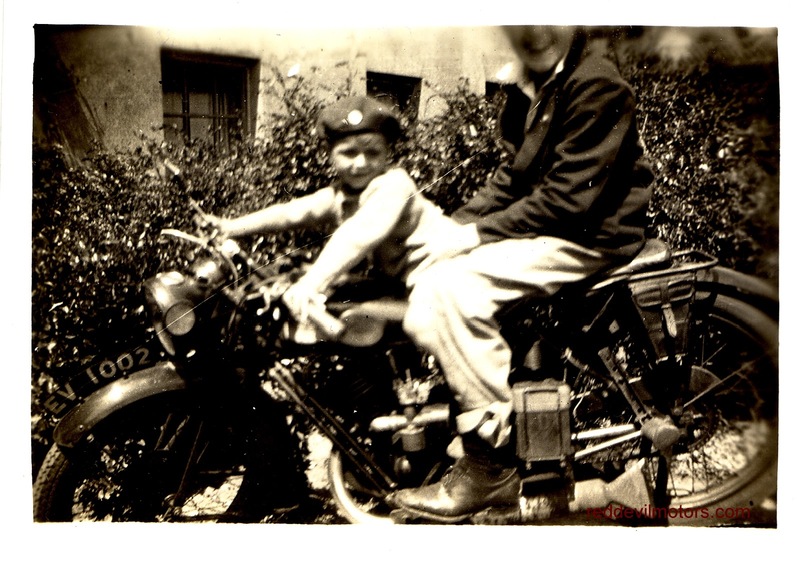 Very few are the photos taken by the common man of the era that are fine in artistic quality but they all tell a story and are snapshots of a lost time. 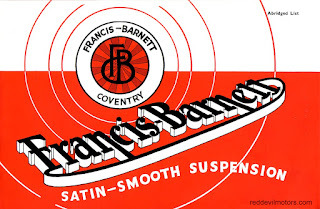 Mid thirties 'built like a bridge' Francis Barnett. 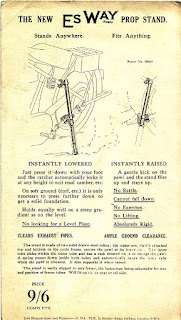 The EsWay prop stand has featured a couple of times before on the blog. Now it pops up again on account of the stand being back on the market. I'm a big fan of these stands, hauling a pre-war bike up on to the rear stand is a bind and carries fairly high potential for back injury. 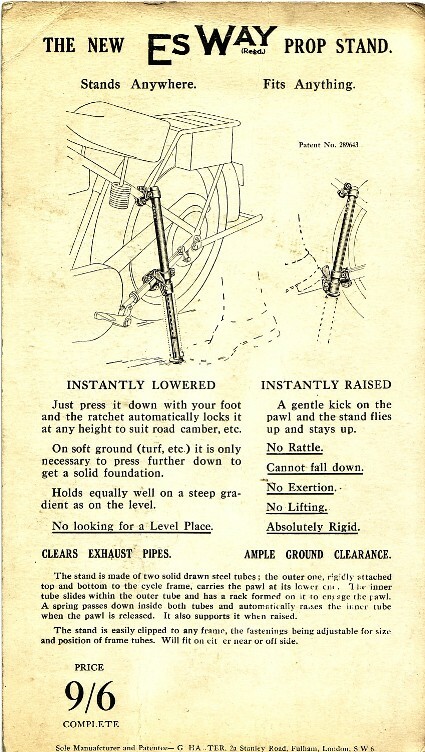 EsWay telescopic stands hit the market in 1927 or shortly thereafter and were available until the fifties (presumably up to somewhere around the point that side stands became standard fitment on all bikes). They're a good period accessory, the design is neat and the function is better than a conventional side stand. Some criticise that it is pretty catastrophic if you forget to raise the stand before setting off but we wouldn't do that would we? Mick Hall has gone to the effort of making these replica EsWays and is selling them under the name of Vintele prop stands. 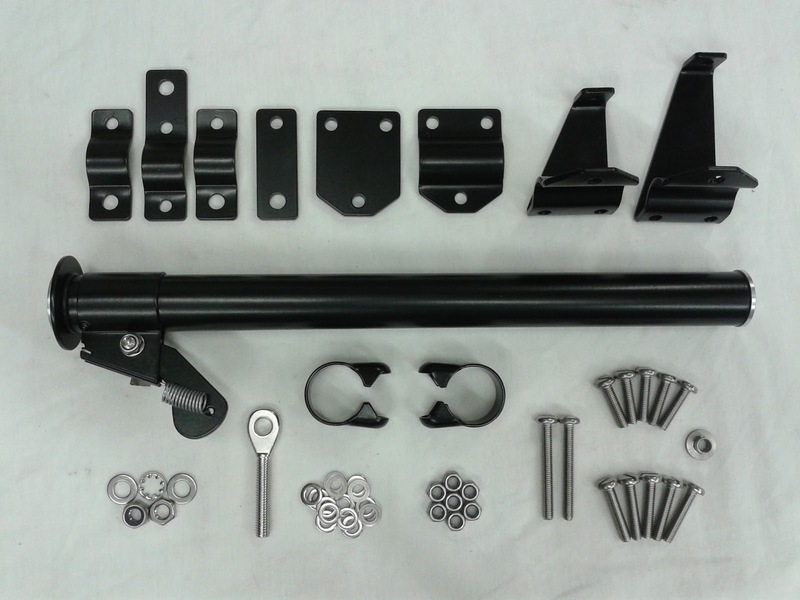 The stands are a very reasonable £120 in powder coated finish with stainless fittings. 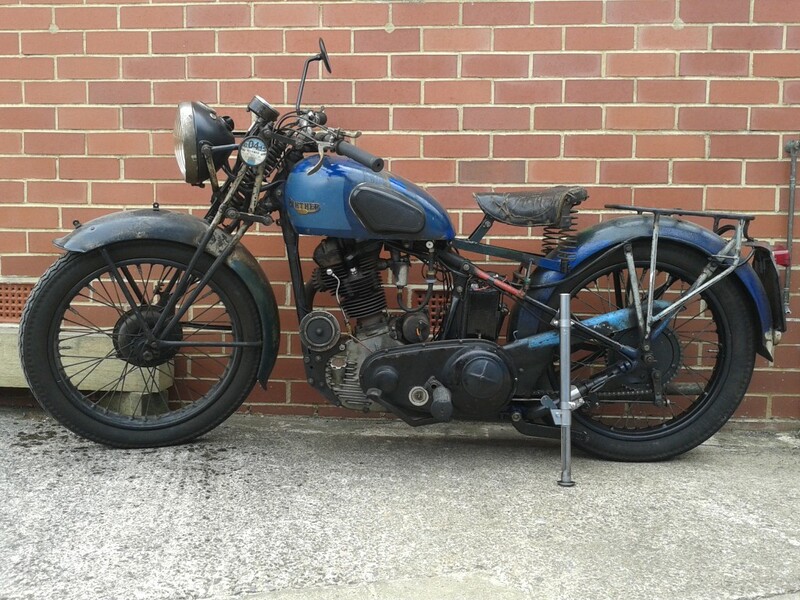 Definitely recommended if you have a pre-war bike. 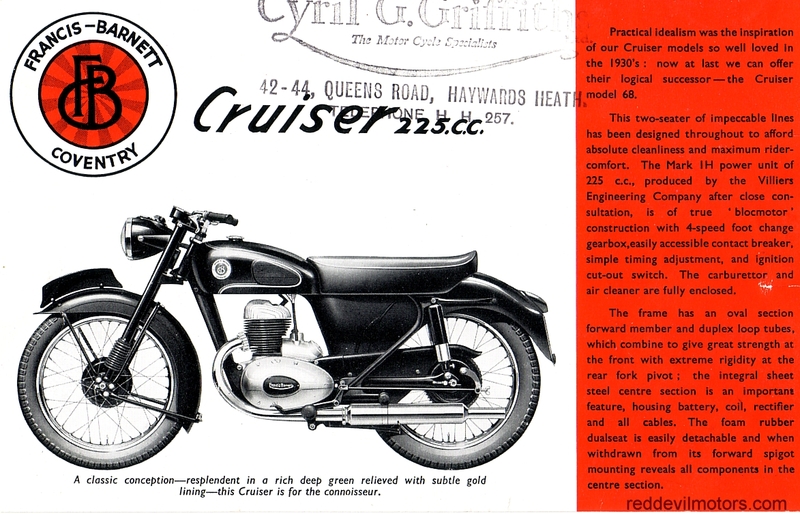 Original EsWay shop card flyer. 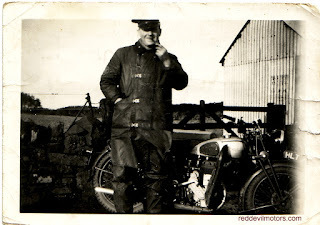 An EsWay fitted to my '27 Triumph Model N.
And one on the Royal Enfield J2. Here's Mick's Panther test bed with unpainted Vintele stand. a labour of love rather than a get rich quick scheme! 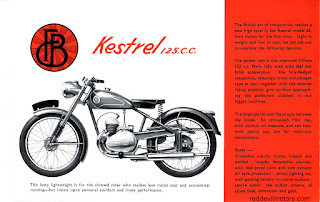 This BSA A7 Daytona rep build was jointly inspired jointly by an image of ace tuner and factory development engineer Roland Pike with a Gold Star Daytona racer at the MIRA test track and a project on the now dormant Beezagent blog. 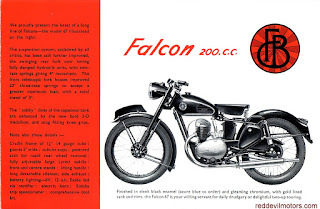 Rather than an outright replica the machine is a homage to the 1956/7 A7 Daytona racers of which 200 rolled out of the Small Heath factory gates. The frame was sourced from K & S who were building replica Daytona frames a few years ago. Other parts were autojumble finds. 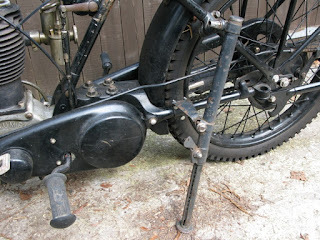 The forks are later and wear alloy yokes and the front brake is a lightly modded conical hub type. The bike was built up by Chris in the South of England and has so far acquitted itself well at a Cadwell Park track day. 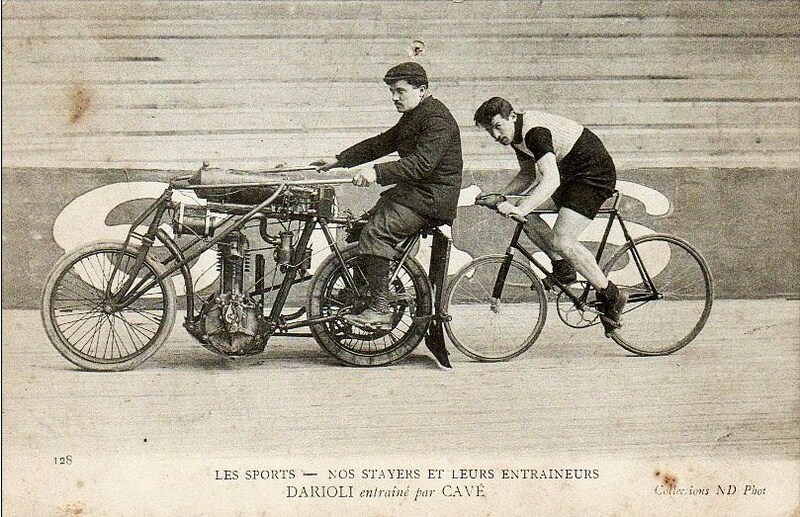 Must be a great fun bike to ride, the power to weight should give a few surprises to the guys on more powerful stuff. 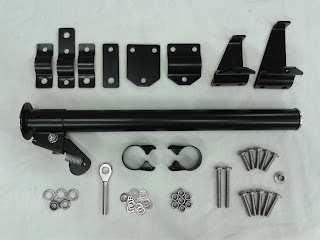 Many thanks Chris for sending in the pictures and details. Chris' BSA A7 Daytona rep.
machine at the MIRA test track. 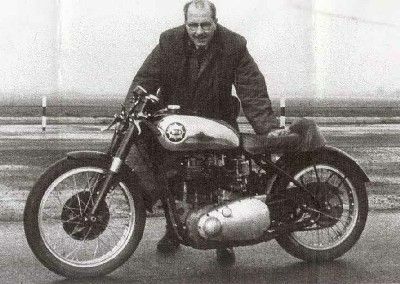 BSA A7 Daytona with Triumph Trident shed-mate. Here's the 'abridged list' catalogue of Francis Barnetts for 1954. Francis Barnett brochure 1954 front cover. 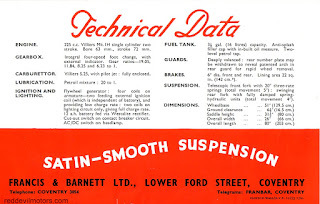 Francis Barnett brochure 1954 page 1. 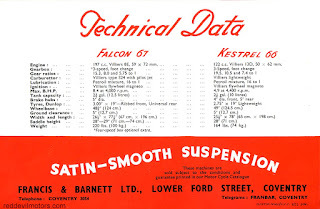 Francis Barnett brochure 1954 page 2. 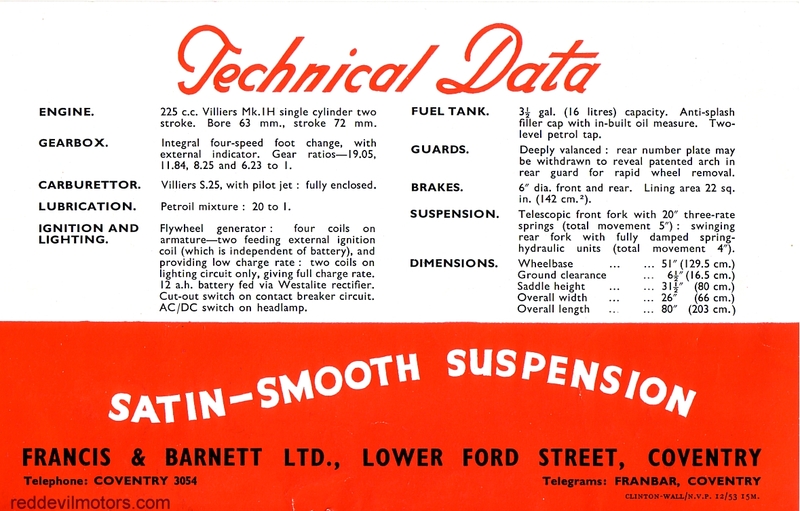 Francis Barnett brochure 1954 rear cover. 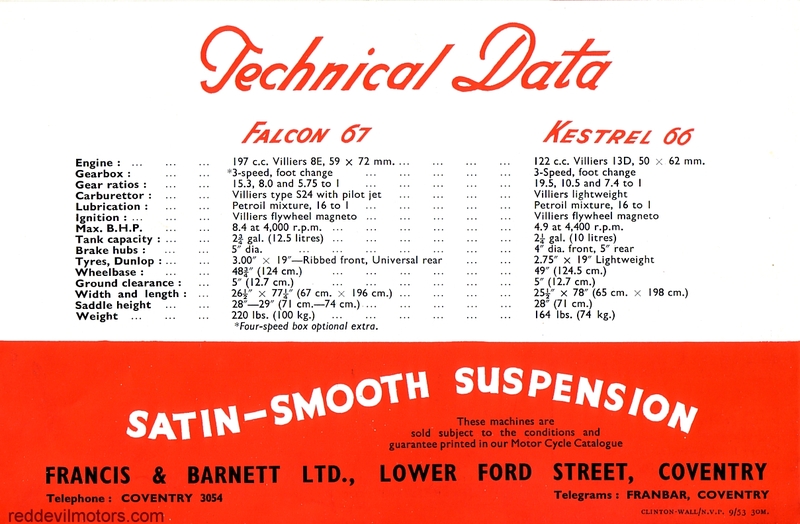 Francis Barnett brochure 1954 insert page 1. 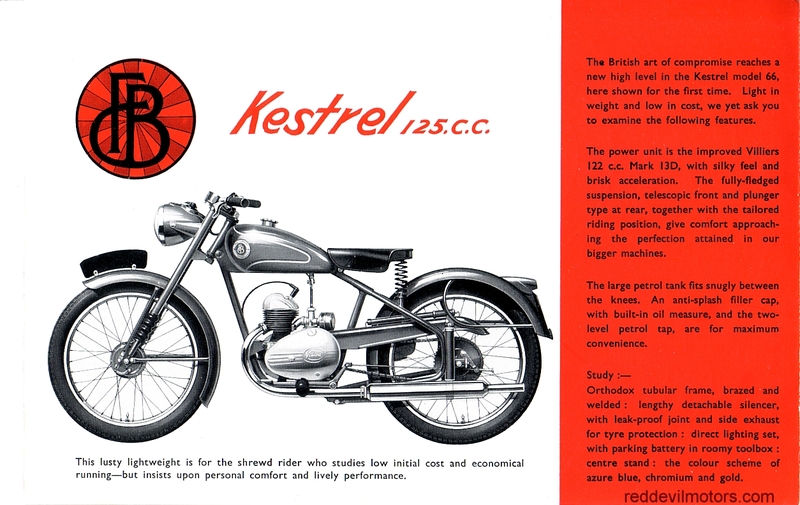 Francis Barnett brochure 1954 insert page 2. 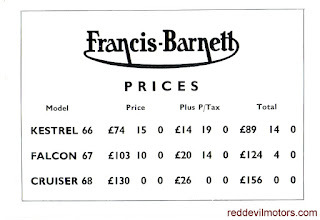 Francis Barnett brochure 1954 insert price list. 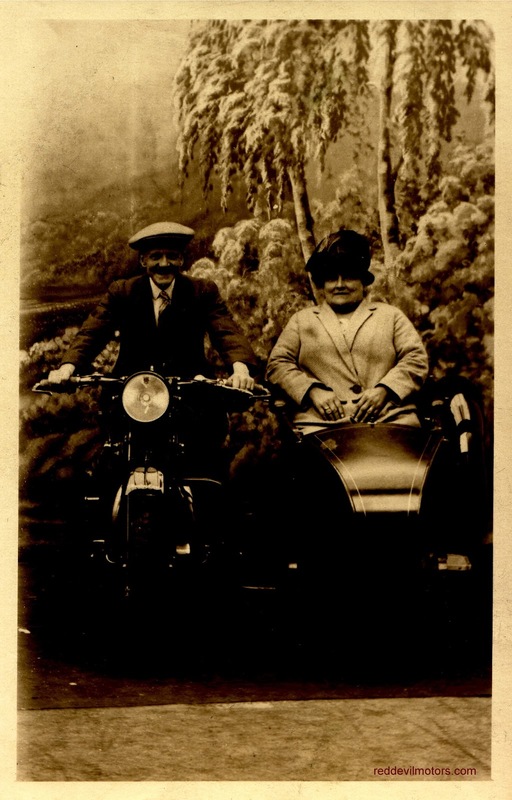 Found this old photo postcard. It seemed familiar and on checking out it is the same machine and studio as this photo. 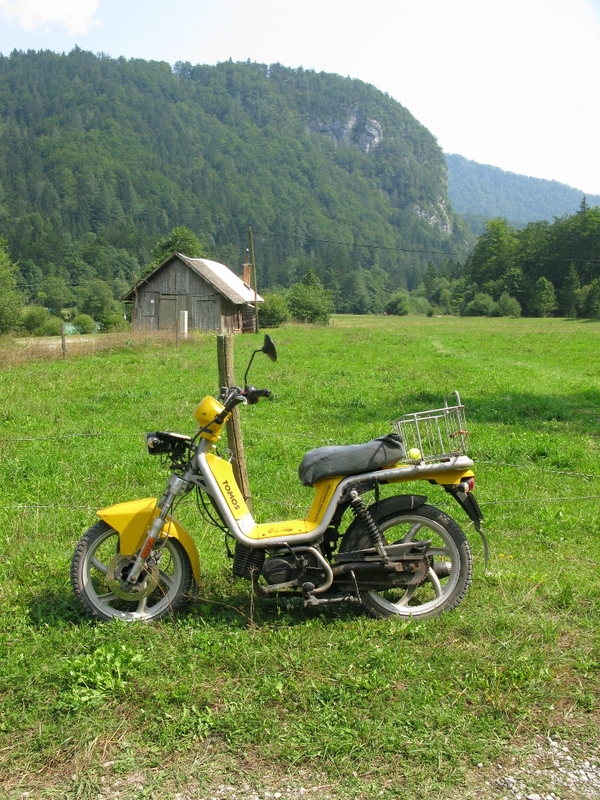 Just back from a holiday in Slovenia. I hadn't realised before that Koper in Slovenia is the home of Tomos. 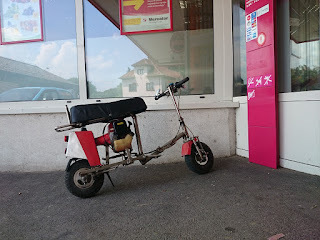 There are plenty of them riding around (not to sure what the plural of Tomos is, Tomii? 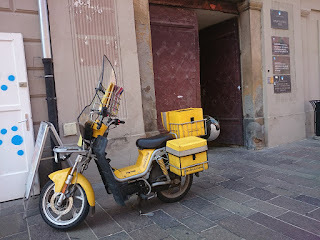 ), I particularly liked the ubiquitous yellow post bikes. The Tomos GB site shows the current models and has a pretty decent history of the marque. Summer is still here. 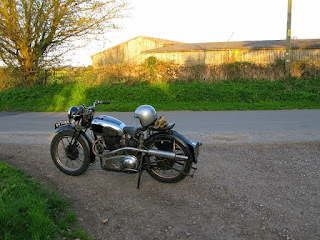 Got in a sneaky short afternoon blast on the Norton Dommi today. Easy enough to spot the bike as a Douglas but I can't go any further than that except to guess that it is from the veteran era. 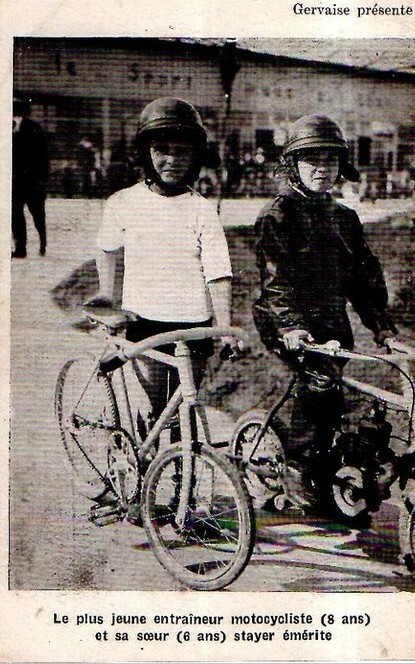 Great riding hat though! Rather a scruffy old photo but oozing with character. A pre-war Royal Automobile Club patrol man with his late thirties Norton 16H combination. 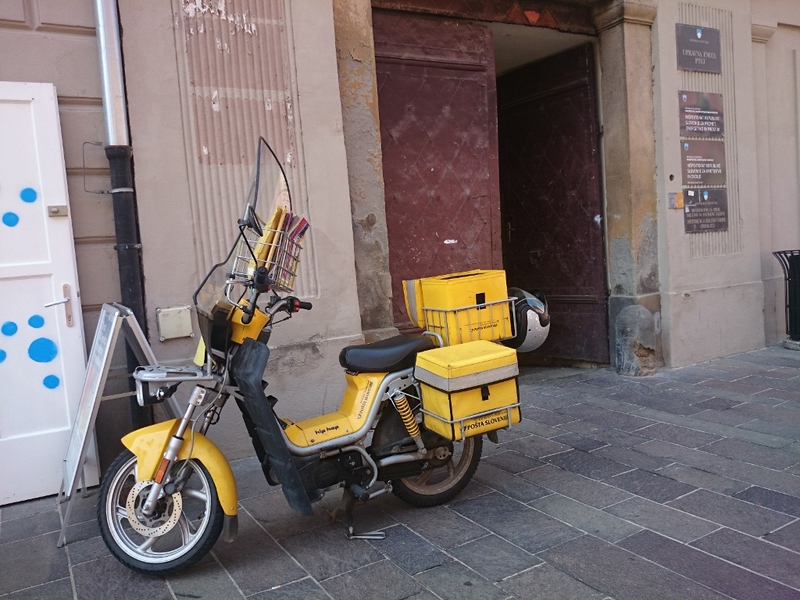 The box sidecar held his tools of the trade. 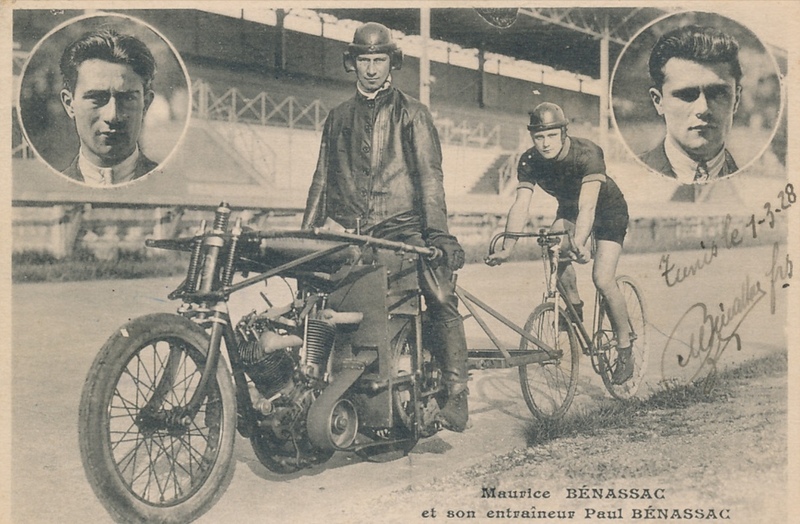 RAC patrol man with Norton 16H sidecar combination.